An investigation into a rocket glitch may delay the planned Oct. 25 launch of the U.S. military's enigmatic X-37B space plane, Air Force officials say. The anomaly occurred Oct. 4, when a Delta 4 rocket blasted the GPS IIF satellite safely into orbit. While the unmanned X-37B spacecraft is ready to fly and doesn't use the Delta 4 — it lifts off atop an Atlas 5 — the Air Force's investigation into the glitch may affect the space plane's launch schedule. Air Force Space Command commander General William Shelton has asked for a discretionary accident investigation board (AIB) to investigate why the Delta 4 RL-10B-2 upper stage engine did not perform as expected during the GPS satellite launch, said USAF Major Tracy Bunko at the Pentagon’s Air Force Press desk. "We’re not sure yet if that will impact the launch date," Bunko told SPACE.com. The upcoming X-37B mission — also known as Orbital Test Vehicle-3 (OTV-3) — is currently slated to blast off Oct. 25 from Space Launch Complex 41 at Florida's Cape Canaveral Air Force Station. The third mission of the X-37B also marks the first re-flight of one of the space planes. This same vehicle flew the first flight, called OTV-1, back in 2010. That maiden journey of the X-37B lasted 225 days. It launched into orbit on April 22 and landed on Dec. 3, zooming in on autopilot over the Pacific Ocean and gliding down onto a specially prepared runway at Vandenberg Air Force Base in California. The OTV-2 mission made a similar Vandenberg touchdown on June 16 of this year, having stayed in orbit for 469 days, more than doubling the 225 days its sister ship stayed on orbit. The two space planes were built by Boeing Government Space Systems. They are each 29 feet (8.8 meters) long and 15 feet (4.5 m) wide, with a payload bay about the size of a pickup truck bed. According to Boeing, objectives of the X-37B program include space experimentation, risk reduction and concept-of-operations development. Boeing’s involvement in the program dates back to 1999. A belly view of the U.S. Air Force's X-37B Orbital Test Vehicle as it sits inside its payload fairing during encapsulation at the Astrotech facility in Titusville, Fla., before its planned April 2010 launch. What payloads are toted into Earth orbit by the military space planes is a hush-hush affair. Nevertheless, the ability to orbit sensors and whatever other hardware is being flown — and then return them to the ground — is receiving high marks. “Now, here’s another historic achievement," Shelton said Sept. 18 at the Air Force Association’s 2012 Air & Space Conference and Technology Exposition at National Harbor, Md. "On the 16th of June, we completed the second orbital test vehicle or OTV mission with the X-37B. OTV-2 spent 469 days on orbit," Shelton added. "The mission was a spectacular success. 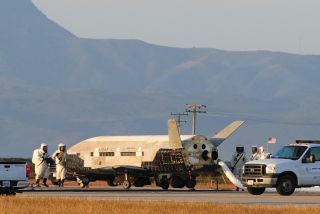 And while we can’t talk about the specifics here, X-37B and the entire team of blue suit, civilian and contractor operator, engineers and testers have absolutely exceeded our expectations." In an earlier communiqué to SPACE.com, Bunko said that there is a possibility of landing the robotic space plane on the space shuttle landing strip at NASA's Kennedy Space Center in Florida, perhaps at the end of the OTV-3 mission. Also under consideration is consolidating landing, refurbishment and launch operations of the X-37B at KSC or Cape Canaveral Air Force Station as a cost-saving step.